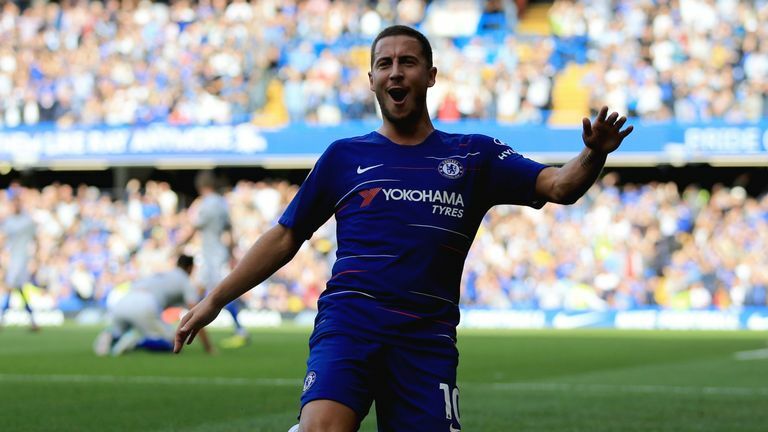 From Eden Hazard's scintillating form to Arsenal's goal-packed start to life under Unai Emery, we pick out the top facts ahead of Super Sunday. The first sees Chelsea travel across London to play West Ham looking to make it six wins out of six. The Blues are one of three teams who have achieved this feat before - but the only club to have done so twice. Ominously for their rivals, Chelsea went on to clinch the title on both occasions. Not only does Hazard top the goal chart this term, he also leads the way in a raft of per-90 stats, including touches, successful passes ending in the final third and successful dribbles. Marko Arnautovic went into West Ham's home game against Chelsea last season without a goal for his new club. The Austrian played up front for the Hammers for the first time in that game last December, scoring the winner - and he has not looked back since. Arnautovic is in good company when it comes to Premier League goal involvement over the past nine months with only Mohamed Salah and Harry Kane directly contributing more goals - a huge difference from Arnautovic's first 11 games for West Ham. Sunday's second game sees Arsenal take on Everton at the Emirates and life under Unai Emery has been eventful so far for Arsenal. Their five Premier League matches under the Spaniard have featured 19 goals - the joint most in the division. Neither Arsenal nor Everton have kept a clean sheet this season, a statistic that suggests we could see plenty of goals at The Emirates. Between them, their games have produced 36 goals - the highest of any Premier League fixture this weekend. Trips to Arsenal are typically painful for Everton. The Merseyside club have lost more away matches against Arsenal than against any other team in their Premier League history and have not won in that part of north London since January 1996.
Who will make your Fantasy Six-A-Side for Arsenal v Everton? Another indication of Everton's struggles in this fixture is the fact they have conceded 105 goals against Arsenal in the Premier League - they are the only team to concede more than a century of goals against one opponent in Premier League history. Super Sunday gets underway from 12.30pm with West Ham looking for their first home win of the season against Chelsea live from the London Stadium. At 3.30pm, attention turns to the Emirates as Arsenal take on Everton - both games live on Sky Sports Premier League and Main Event.